Homemade soup is one of my favourite things about winter. In fact, comforting warming food and Christmas are pretty much the only things that I like about winter at all. I’m very much a warm weather girl. That said, I’m not one for “soup in the winter, ice cream in the summer” I’ll eat what I fancy, whatever the weather is doing, thank you very much! But, I must say that I think to make soup more when it’s cold outside. When I need it! For my Parsnip and Apple Soup, I use apples from our tree in the garden. I’ve got absolutely no idea what they are, but they taste great. I freeze loads throughout the summer so that I’ve got plenty of apples ready to make apple sauce, apple crumbles and Parsnip and Apple Soup whenever I fancy. We’re good for apples all year around. However, if you haven’t got an apple tree, use the apples that you like the best, depending on whether you want your Parsnip and Apple Soup to be sweet or tart. 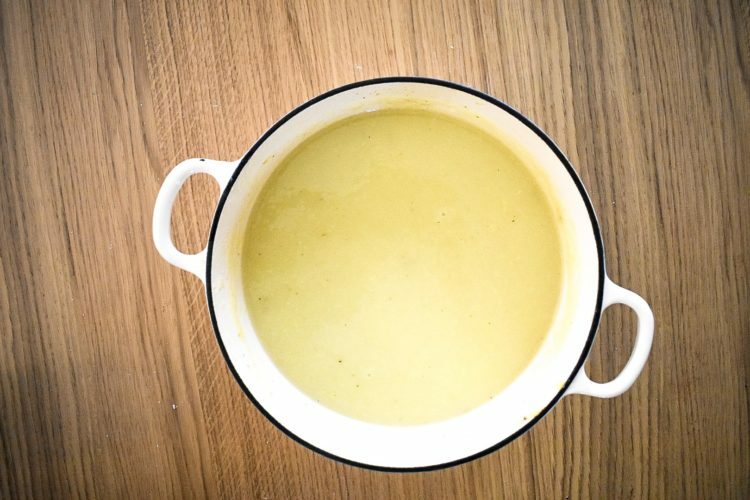 My Parsnip and Apple Soup uses cream and chicken stock, but you could skip the cream and use vegetable stock if you need to. It would still taste fab. Actually, I think to truly make your own soup, you should also make your own stock…but who has got the time for that? I Serve my Homemade Parsnip and Apple Soup with homemade crusty white bread, as a proper filling meal. It could be a lighter meal and even a snack too though. 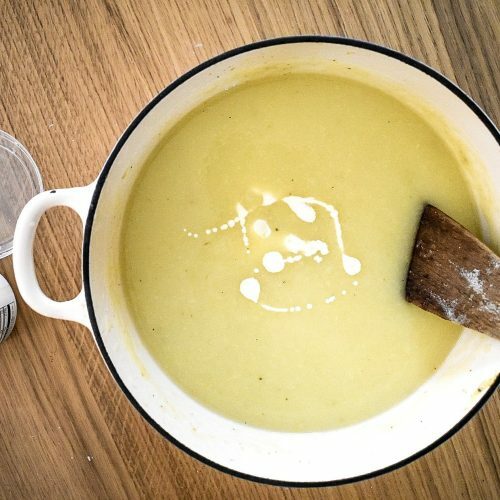 This sweet and creamy soup is the perfect winter warmer! I think I made it up! That’s what’s amazing about soup, you can throw everything in! I have to say I am not really a soup fan, never have been. I have never thought of parsnips and apple going together, but it sounds interesting. Thank you. I think I’m too lazy for anything that isn’t quick and simple! 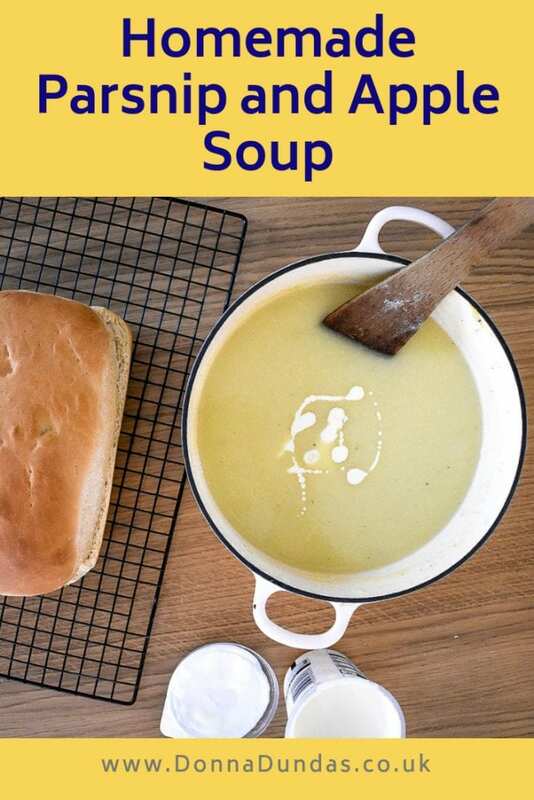 I love a homemade soup, and this one looks yummy. I’m not a fan of parsnip and I don’t generally like fruit in savoury dishes but something about this makes me want to try it anyway. I’m funny with parsnip, I like them in stews but that’s it usually! See it looks nice and i love soups but I am definitely on the fence with this one I think! It’s the apple in savoury! Ah I’m always a big fan of mixing fruit with savoury dishes! I love the combination.